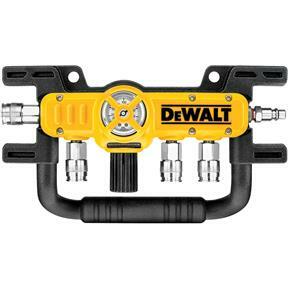 The DEWALT D55040 Quadraport Air Line Splitter is used to convert a single air supply into four separate air lines for multiple tasks requiring more than one air supply. It can be hooked up to any system for extra versatility and can handle pressure up to 200 PSI. The DEWALT Quadraport splitter is equipped with four 1/4-inch female quick disconnects for a fast and easy hookup and has a built-in high volume air regulator allowing adjustments to achieve the right pressure for the job. The splitter's non-marring exterior is safe to run over finished floors.